Hop into your trolley and zoom around the zoopermarket! Are you ready for a totally wild time? This isn’t just any old supermarket, stacked with cans of beans and milk cartons. Every time you lift the flaps and peek at these weird foods, you’re going to get a huge surprise! A jar of prickled onions? Ouch! A bag of fangtastic salt-and-finegar crisps? Yum! An ape-ricot dessert? Uh-oh – watch out for gorillas! 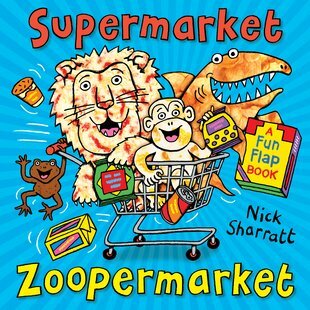 Bursting with crazy pop-ups, fun flaps and bold artwork, this is classic Nick Sharratt: totally fabulous fun!